Smallest - with females, 3 – 7 lbs. Largest - with males up to 7 – 20 lbs. Arctic fox fur changes seasonally. In the winter, they sport fluffy white coats that blend into the snow; in the summer they shed these coats for brownish or grayish, shorter fur that helps them camouflage into bare rocks and dirt. Arctic foxes are opportunistic omnivores and very curious. They will eat almost anything. While they prefer to hunt and catch small animals, they will also consume insects, fruit, and even carrion. Arctic foxes are monogamous, meaning they mate for life. They can have two litters in a season and will emerge from the den at about four weeks old, staying with the male and learning to hunt. In their home in the arctic tundra, food can be scarce. 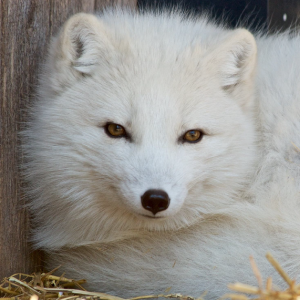 Because of this, arctic foxes will eat almost anything, including rodents, birds, insects, and even carrion! In the summer months when food is plentiful, they will hide extra food under rocks to sustain them in the winter.